MUMi-LinuX was a Linux distribution for dedicated servers and desktops, developed by Muammer Altuntas, Eastern Mediterranean University in Cyprus. It uses TAR.GZ packages and was optimised for the i686 architecture. MUMi-LinuX Desktop was an easy-to-use Live CD with an option to install it on hard disk. Rate this project KANOTIX is back! JÃ¶rg Schirottke has announced a public release candidate for the upcoming KANOTIX 2007. What's new? "Kernel 2.6.22 (Ubuntu kernel with modifications and some patches); i586 optimisation - not for use with older CPUs; 192 MB RAM required, 256 MB RAM recommended; Acritox installer, install program with many new functions; actual KANOTIX theme from Cathbard; X.Org 7.1.1, Beryl 0.2.0, VDR 1.5.2, ALSA 1.0.14, NdisWrapper 1.47; Aufs / Unionfs support; GParted 0.3.3 with NTFS resize; ntfs-3g support; KDE 3.5.5, OpenOffice.org 2.0.4, Amarok 1.4.7, K3b 0.1.3; Iceweasel 2.0.0.6, IceDove Mail/News client 1.5.0.12, GIMP 2.2.13; new functions which have to be discovered ;)." Read the short release announcement for more information. 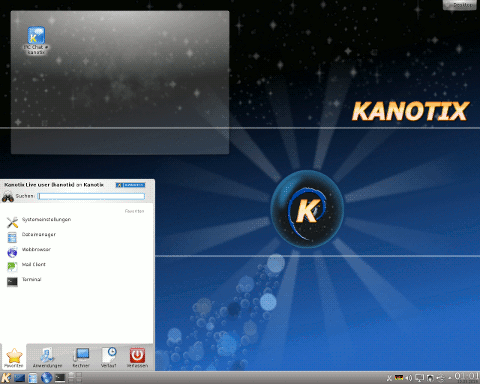 Download: KANOTIX-2007-THORHAMMER-RC6.iso (702MB, MD5).